One of the nation's lost treasures, it was the home of the Hamilton family and was the largest non-royal residence in Britain. Sadly, as a result of mining subsidence, it was demolished in the 1920s. Trace its fascinating history and that of the surviving buildings, including those which make up Low Parks Museum - Portland House, the Palace Riding School - and Hamilton Mausoleum. A journey through time from our oldest exhibit, a bronze age burial, to traces of Roman occupation and the formation of South Lanarkshire's Royal Burgh's, featuring one of the oldest sporting trophies, the Lanark Silver Bell. Prior to the Industrial Revolution, agriculture and dairy was a major industry. South Lanarkshire's best-known symbol was the Clydesdale horse. Weaving changed the face of Lanarkshire - there were hand looms in every cottage in every town and village. An original loom can be seen, and we tell the story of Hamilton's unusual lacemaking industry. Coalmining began as small-scale, most deep deposits were only exploited after the technological developments of the later 1800s. There was a mining boom, and by 1874, there were dozens of collieries. Our displays are a reminder of that history, and feature Scotland's worst mining disaster at Blantyre Pit in 1877, when 207 miners died. 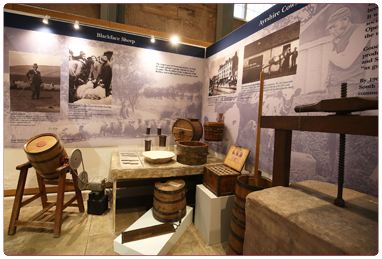 This gallery tells the story of the Lanarkshire regiment, raised in Douglas in 1689. Its initial recruits were Covenanters, making it the only British Army regiment with a religious origin. As Scotland's only rifle regiment, it disbanded in 1968 rather than merge and lose its unique identity.